Take I-65 South to I-20/59 South to Tuscaloosa. Take Exit 118 and make a right on Valley Road. Go to the 2nd light, turn left onto Aaron Aronov Drive. 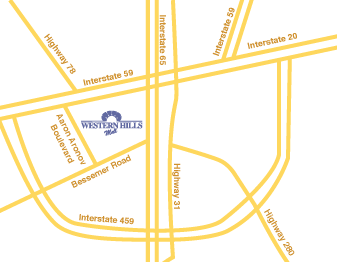 Western Hills is on the left past Wal-Mart. Take I-20/59 North to Birmingham. Take Exit 118 (Valley Rd). Turn left at the end of the road onto Oliver Blvd. Go to the 3rd light and turn left onto Aaron Aronov Dr.